Want to bring bullying prevention to your classroom? Share these great ideas with your teacher and start spreading the message: No one deserves to be bullied! A fun activity to show what happens when everyone takes steps to prevent bullying. Trace and cut out your foot step on orange paper. Write a message on it sharing something you can do for yourself or peers. Post all the steps on a hallway floor or wall, in your classroom or even a stairway. You can participate in the “Students with Solutions” activities. Write a story, create a drawing, take a photograph or film a video. Submit to PACER’s National Bullying Prevention Center to be eligible for awards and recognition. This is a contest for everyone, even entire classrooms! A free eight-page classroom activity book featuring the Club Crew from KidsAgainstBullying. The content provides activities to help think about feelings, explore responses to bullying situations, and take the pledge to be a Kid Against Bullying. Available to print as full color or black and white. Read “Spookley the Square Pumpkin,” which follows the story of a square pumpkin who lives in a round pumpkin patch world. Speak up. Reach out. Be a Friend for Change! Join Disney Friends for Change and PACER and help put an end to bullying! When you see someone bullying or being bullied, you can make a difference. Check out the tips in this guide to learn how you can take a stand against bullying! Be a kid against bullying! Students can also set up a table at school where peers can sign paper copies of the pledge. Sign the online “Kids Against Bullying ” pledge. Hold a pledge signing event at your school. 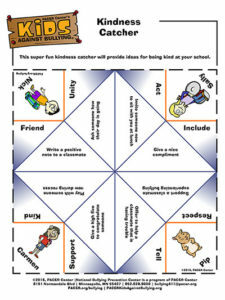 A fun way to get ideas for being kind to others. Bullying is no fun, but learning about it can be. PACER’s coloring book pdf icon gives teachers and students a great opportunity to talk about bullying while they have fun. Each page includes an important message about respecting others, valuing differences, and being a friend. Discover how kids and crayons can help prevent bullying. Link students, schools, and communities – through statements on orange paper – to create a powerful visual about uniting against bullying. Create the strips (links) using sheets of 8 ½ x 11 ORANGE construction paper. Create a banner that will help students understand the concept of above the line versus below the line behaviors and make a commitment to promoting above the line behaviors at their school. The Unity Tree is a powerful symbol reminding everyone that bullying can be prevented when we all come together – united for kindness, acceptance and inclusion. Creating a Unity Tree is an interactive and hands-on activity, a shared experience in which anyone can participate and everyone can watch the tree grow. Each person contributes their own unique experiences, creative ideas, and strategies by writing positive messages on leaves that are attached to the tree. As the number of leaves increases, it creates a visual reminder, demonstrating that when we are united we can create social change. On the classroom wall or bulletin board, create the trunk of a tree, along with branches, with construction paper or materials of your own choosing. Next, cut out leaf shaped pieces of orange paper; make them large enough for students to write a message. If you planted a seed, what would you tell your seed about bullying? What can you do change/impact your school’s culture about bullying? How can you support a friend/peer who is being bullied? Have each student write down their response on a leaf. Attach each of the leaves to the tree. Fill the base of a flower vase with the cotton balls, tissue paper, or other materials. Take tree branches, sticks, skinny craft sticks, or another ‘branch-like’ item and place inside the vase, so the material holds it vertically upward. Cut orange paper into strips of 1 ½” to 2” wide and 11” long. Ask participants to write a message on the orange strips of construction paper, which will represent the “leaves” of the tree. Tape each response to the end of the slip around a tree branch, so the message is easy to read. A poster can also be displayed next to the tree that lists the questions that were used in students creating the messages for the leaves.